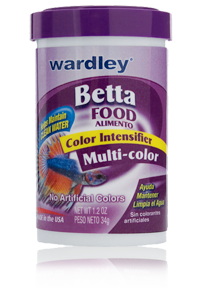 Wardley® Multi-color Betta Food is balanced and nutritious, mini floating pellets, formulated with Carotenoids, Spirulina, Marigold and Shrimp Meal, for intense Betta color! Formulated for Bettas and other small tropical fish, this diet contains no artificial colors or dyes that can harm fish or cloud water. Check out our entire lineup of Hartz® and Wardley® Fish Supplies!